The JPL Biological Materials Archive demonstrates how NASA & JPL are committed to preserving and documenting microorganisms that may be of significance in understanding planetary exploration. 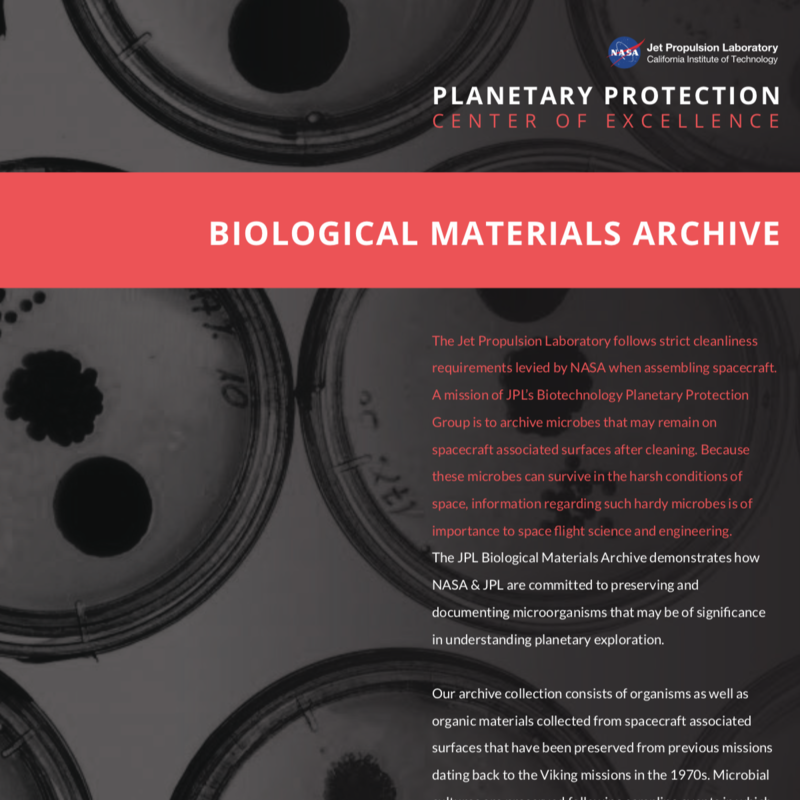 Our archive collection consists of organisms as well as organic materials collected from spacecraft associated surfaces that have been preserved from previous missions dating back to the Viking missions in the 1970s. Microbial cultures are preserved following sampling events in which spacecraft are verified for microbial cleanliness. The spacecraft and cleanroom environments are both unique and harsh, typically dominated by hardy microorganisms, creating a one-of-a-kind collection. The Jet Propulsion Laboratory takes great precautions during missions to avoid the possible introduction and proliferation of Earth microbes from spacecraft on any planetary body with the potential for past or current biological activity. To prevent either forward or backward contamination, the essence of planetary protection, spacecraft hardware must be cleaned and/or sterilized as well as evaluated for the presence of microorganisms. 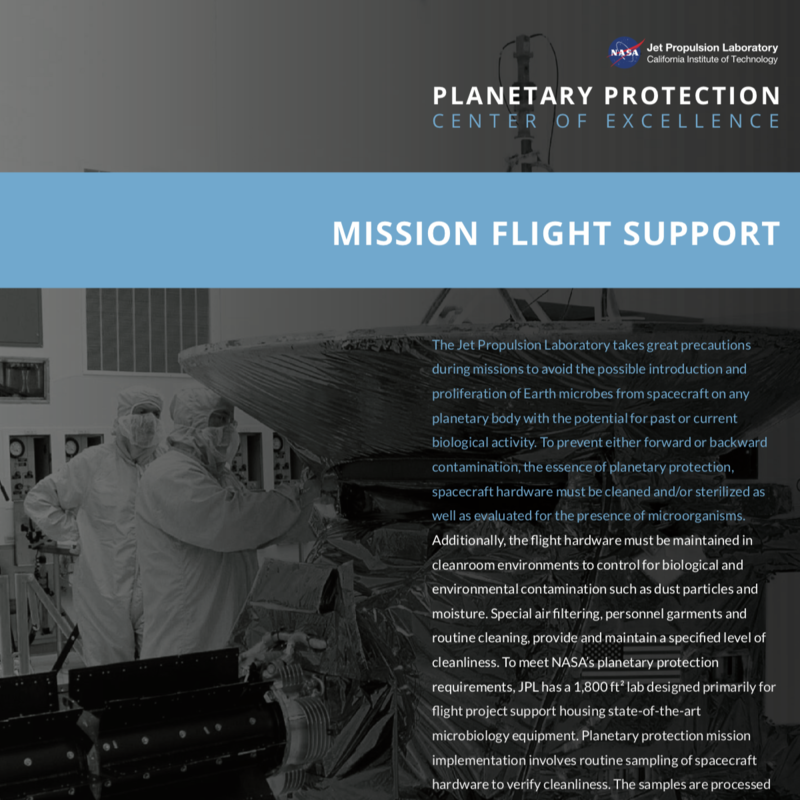 Additionally, the flight hardware must be maintained in cleanroom environments to control for biological and environmental contamination such as dust particles and moisture. Special air filtering, personnel garments and routine cleaning, provide and maintain a specified level of cleanliness.